Last blog entry I wrote about some of my experiences traveling through Europe with my Windows RT devices. For the most part I was able to do 90% of everything I needed to do with my Asus Vivo Tab RT. and Surface RT. I also mentioned that there were many times where Wi-Fi was just not an option for me and I think that broadband should be included in all devices and give you the choice on whether or not you want it. I also mentioned that as my ASUS Vivo Tab RT is locked to AT&T and that AT&T would not unlock it before I left for my trip, they wanted to charge $120 for 800Mb per month to use it internationally I had to use it sparingly. In most of Europe carrier lock is illegal. I purchased a 3GB 90 day SIM from the UK carrier THREE for about $30 for my Samsung, which isn’t carrier locked. I actually have 6 devices from that use AT&T data service: An ASUS Vivo Tab, the Samsung Series 7 Slate, an iPad 2, my Sony Vaio Z2 ultrabook (this was a custom build I special ordered), the Nokia Lumia 920 phone and a portable MiFi. Needless to say my AT&T bill is usually expensive, even with the 20% service discount. You might have picked up from my previous article that the Asus Vivo Tab RT was my new favorite device. It is light and the battery lasts a long, long time. I caught up on the last few episodes of NCIS on the flight to London and still had battery to spare to finish reading Jim Butcher’s latest Harry Dresden novel, COLD DAYS on the Barnes & Noble Nook App for Windows RT / 8. When I returned to the US, I hadn’t used the Asus for a few days so I charged it up and prepared for a sales meeting so I could demo one of our new Windows 8 Modern Style applications to our sales team. This application needs an internet connection, so the Asus Vivo Tab was the right choice as it has broadband with AT&T. You never know if the sales people will suddenly decide to have the meeting over lunch, mostly a place that doesn’t have WiFi. This is exactly what happened, by the way. When I went to demonstrate the application, I first needed to connect to AT&T before I started the app. When I selected Networks from the Settings Charm, I got a message that Broadband was turned off. That’s odd, but ok, except it Windows 8 / RT doesn’t allow you to turn it off and on here. 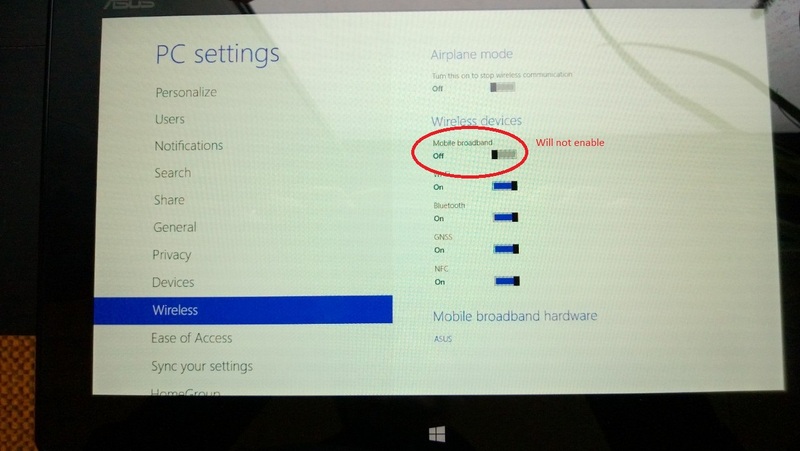 There is “Airplane Mode” which turns everything off and on, but it didn’t enable Broadband. Ok, I still have time and I know what to do. Again I select the charms bar and settings only this time I picked Change PC Settings, and then Wireless. On this “Windows Modern Style” control panel, you can turn on and off all the wireless settings like WiFi, Bluetooth and Broadband individually. The control panel displayed that the Broadband adapter was off, so I turned in on. And it turned itself off again. It’s kind of like when you are waiting for the elevator, and you need to get somewhere so you press the button a few more times hoping that the sixth time you press the button, the elevator would magically appear except it doesn’t. I thought to myself, Ok, at the core this is Windows, so I will reboot. Everybody knows that. After rebooting, it still didn’t enable. I ended up demonstrating just the portions of the app that didn’t need internet and just spoke about the rest. When I got home, I dug a little deeper. In Windows 8/RT On the wireless control panel page I mentioned earlier, there is an option to get additional details about the wireless devices. You can bring up the IMEI id, information about the firmware version of the device, the wireless number and SIM ICC ID. When I opened that page, the SIM id was BLANK. AH, we are getting somewhere I thought myself and ran the diagnostics on the Broadband adapter from the Network Connections dialog. It came back with a message to insert the SIM. Ah, it’s a SIM problem, I need to go to AT&T. The next day I went to my local AT&T store. The people that work there are usually pretty friendly and helpful. I explained and demonstrated the situation, and they told me they had seen it before. All we need to do was reboot the device, go into the control panel and turn the Broadband back on. I am thinking to myself, I have already done this, but I humored them and let them do it. Obviously that didn’t help. The customer service agent at AT&T decided that the SIM was probably bad, and said she would happily replace it. That sounds good enough for me, so I let them swap out the old SIM for a new one, and we waited for the service to be enabled and restarted the ASUS. While we were both sure this would fix it, it didn’t. Broadband still wouldn’t enable. 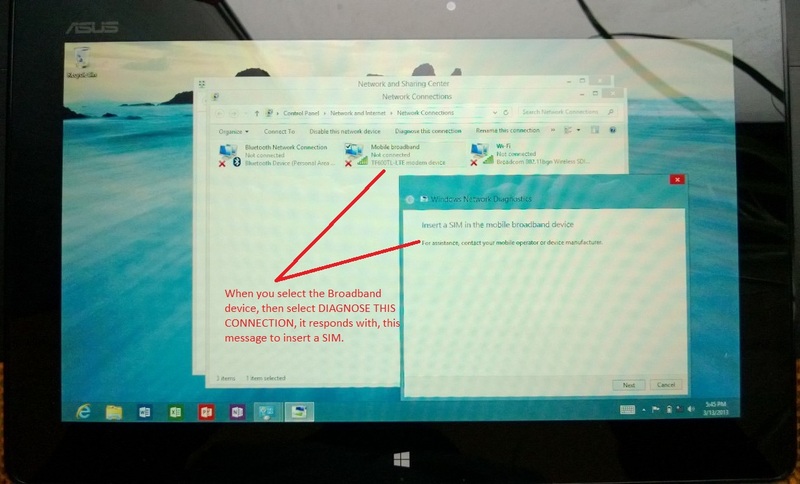 OK, so to me, that means it is not the SIM, it’s the device itself isn’t detecting the SIM. At this point, the customer service agent recruited a senior customer service agent to help and I had 2 people working on it. After about an hour, they decided that it could probably be some sort of OS corruption, and we should reset the device. In Windows 8 there are two options for this. Refresh and Reset. Refresh returns the device to its original state, but keeps your Windows 8 style applications and user accounts. Reset, returns the device to the new, factory setting. I told them it was OK to select Refresh. Refresh took about 30 minutes. I logged in and we found that nothing had changed. Broadband still wouldn’t enable. The AT&T senior customer service agent told me that should have fixed it and since it didn’t, and the device was less that 60 days old, they would replace it under warranty. I like that idea, most of my data was on Microsoft SkyDrive and a 64GB micro SD, it is easy to re-install my applications from the Windows Store and my profile and setting will come back when I use my Microsoft ID. Things were looking up. The AT&T senior customer service agent placed a call to what he said was warranty replacement, and spoke to them for about 10 minutes. They asked him all kinds of questions, and he hung up, frustrated. He said they told him that *I* needed to call AT&T business direct technical support at 1-866-288-7629 and speak to a technical support person who needed to perform a few more tests before they would ship me a replacement Asus. He assured me it wouldn’t take long, and they would ship me a new one and I would ship the old one back afterwards. The following day, I called the AT&T business number and followed the prompts. When the agent on the phone asked me for basic information regarding my call, I had a difficult time trying to make the agent understand that I was no longer sure the “mobile number” associated to the tablet was the same because the SIM had changed. Turns out it didn’t, but it wasn’t until had had told her that I had multiple devices and she would have to look it up, did she realize that the Asus Vivo Tab I BOUGHT from AT&T was the device I was calling about. The phone agent had me step through the processes I had done before, and also did at the store before she determined there was a problem. She said she would transfer me to someone who would take the details to ship the replacement device and promptly hung up on me. I called the AT&T business number again and followed the prompts again and got to another service agent. This person and the last person had NO RECORD that I had already spoken with 3 people already. I have got to start writing people’s names down. The new AT&T agent also informed me that the number I had been given 1-866-288-7629 (which is listed as AT&T Business Direct) was not the number I should call, from now on when I have issues I should call 1-800-331-0500, which is average ordinary customer support. This new agent, also had me go through all the same steps as before, but this time we did a RESET on the device, which wiped all the data and sent it back to the factor default. Broadband still didn’t enable. This agent informed me that it isn’t actually an AT&T issue, and that she can’t authorize a warranty replacement of the device. This agent told me that she would have to transfer me to ASUS technical support and have them replace the device under warranty. This is where even I start to get confused. I realize the device is manufactured by ASUS, but I purchased it from AT&T because of the built in broadband. If I wanted just the ASUS itself, I would have just ordered it online from anywhere, or bought it at the Microsoft store in the local shopping center. I asked the agent to remain on the line until I was successfully handed off to the ASUS agent and she obliged. 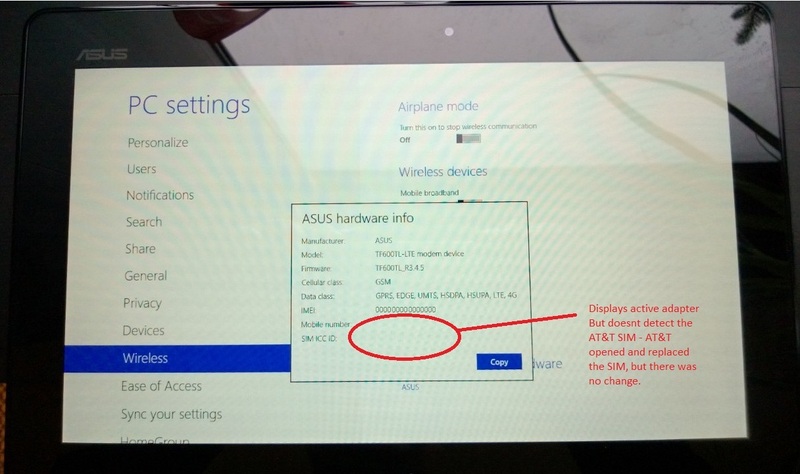 Once I was speaking with the customer support agent at ASUS, the AT&T agent hung up. I proceeded to explain the situation to the Asus agent. We started the entire “troubleshooting” process again. After being convinced that there was indeed an issue, she told me she would issue an RMA number. Unfortunately she said, Asus will not replace the device under warranty, because it was an AT&T issued device and AT&T should have replaced it IN THE STORE. The Asus agent said I would have to ship the device to them, they would test it and call me to tell me what my options are. So here I am, with a device that is less that 60 days old. I bought the device because I need a Windows RT tablet with Broadband and I am a loyal AT&T customer. I have 6 devices, and my average bill is usually more than $300. You would THINK that AT&T would want to help me and support the device they sold me. And what about ASUS? I have many ASUS devices, and this device cost me just over $700, that I paid for myself it wasn’t given to me. Since it is less than 60 day old you would think they would want to just replace it. After all, I speak to customers worldwide about technology adoption for one of only 13 Microsoft Global Alliance Partners, Sogeti. And guess what, my blog gets published to the Sogeti Labs main page when updated. Do you feel that these technology vendors sometimes make it really difficult to get good customer support? Do you feel that sometimes you get the run around because eventually you will get frustrated and just go away? I would like to get your feedback. Good responses will get posted.